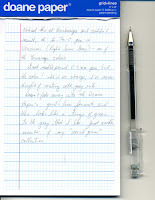 I've gotten to like these Pilot Hi-Tec C gel ink pens, even with the needle point (as long as it is a 0.5mm). I still hold the pen too lightly, as I'm afraid I'll bust the tip but eventually my hand signals my brain that I can grip more tightly and the muscles tighten up. Which makes the line darker and more noticeable. This Hi-Tec-C is another one of the Yuwargi colors, Kurikawa or Chestnut Bark Brown. It's definitely not an ordinary brown, but softer and I'd say a touch lighter. A bit darker than milk chocolate, with perhaps a dash of red in it (but not too much to be seen clearly). 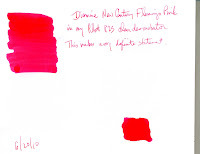 A great color, and if you're collecting gel ink pens in different colors try this one out. As ususal, Doane Paper is the test pulp. The National Stationery Show is the place to showcase paper products, but also one of the places to show off unusual items. Travelling down the first aisle of the show (the 1100s), C and I spotted Periscope Light, an amazing collection of lighted padfolios and covers for the Kindle and Nook, as well as lighted covers for those paper things we used to read a lot...oh, yeah--books. I have a Kindle 2 and use an M-Edge leather folio to protect it. The M-Edge has space for a notepad and a pen, but lighting is a problem as the detachagle lights I've used have damaged the inside suede cover. While it may seem like an e-reader doesn't need a light, it actually does: the e-ink is a dark gray-black on a lighter gray background, and reading can be strained even in a fairly bright room. Having a light directly shining on the face of the e-reader makes it readable. Since iPads are backlit, this isn't a problem for e-book readers. I've only found one light that I thought was bright enough, and didn't bother my eyes. 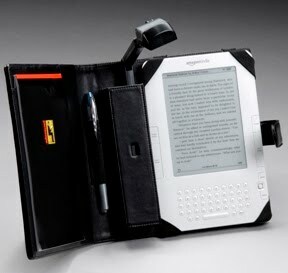 Aesthetically, the thing reminds me of a steampunk worm gnawing at my Kindle, not a look I really like but functional. What I've wanted was something that looked good and would light up my e-reader, but also have space for odds and ends, paper and pens. The Periscope Light is that and more. The Periscope Light e-reader folio for the Kindle 2 and Nook is a faux leather holder that comes with a built-in retractable twin LED reading light, and space for a notepad as well as a centrally-located pen holder. This e-reader folio is amazing. The built-in, wide-angle, high intensity LED light can illuminate the entire face of a Kindle or Nook, or a writing area for that matter, in clean white light. The light is at the topf of an arm that automatically turns on when extended, and turns off when retracted. So all I do is flip out the top and start reading. In addition to the e-reader folio, Periscope Light also offers a larger, lighted Executive Padfolio (pictured above with a Rhodia No. 18 notepad) that can handle an 8 1/2 x 11 padnotepad and has an expandable document compartment, along with zippered storage and pockets for business cards and a calculator. Also in a faux leather finish, the Padfolio can also fit an Amazon Kindle DX wireless reading device in its large pocket (to the left in the above pic). But this combination is not ideal (the Padfolio suddenly becomes too heavy), so if you have a Kindle DX I'd advise getting the new flip top folio. As soon as we saw these C and I were in love. C is in media arts and working on an MFA, and note-taking while watching a film can be highly interesting (first time I've ever heard of someone taking a notebook, pens, and a flashlight to class). With a Periscope Light Padfolio, the problem is solved in an extremely stylish manner. But C is also involved with her alumni association, and she talked with the Periscope Light guys (wave to Eric!) about selling these with her alumni association's logo on the front. cover Which is how I ended up with mine--C ordered some samples with the school's Media Arts logo, and I joined in. Now I'm Periscope'd and loving it. The Periscope Light is also available for pocket-sized paperbacks and large hardcover and trade-sized books, if you're more into paper than e-ink. But with the price of the Kindle 2 and Nook dropping through the floor, it you're going to go with the e-reader then you need to consider a really nice folio for it. They're available online, at some chains such as Barnes and Noble and Restoration Hardware, and at local outlets. The notepads that came with the e-reader folio and Executive Padfolio didn't quite thrill me, so I added my own. But the e-reader's space for a notepad is too big for my Rhodia No. 16, and too small for the Rhodia no. 14. Guess which small notepads fit just right and look really cool? Grid+lines wins, and it looks like I'll be ordering more small Doane Paper notepads to go with my Periscope Lighted e-reader folio. 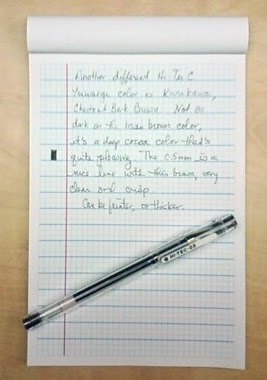 One of the Pilot Hi-Tec-C gel ink pens that just arrived at Kinokuniya is from the Yawaragi Colors collection, a light gray ink called Usuzumi. I saw this a few weeks ago and was really taken with it, so much that I kept trying to remember if I'd seen it before and passed it by or just never noticed (that's the problem with gray things, you never notice them). But this was in the pen section marked "new colors" so I decided to check it out along with a few more that I'll test drive in the next week or so. I find this gray gel ink pen, with a 0.4mm tip, to be quite delightful. It meets a need I've had that's a bit absurd but there nonetheless: I want a pen that writes like a pencil, or vice versa. Something with ink the color and look of graphite, but won't smear like a pencil does. The Usuzumi really fits that criteria quite well. The line is just the width of a nicely-sharpened pencil, the gray ink doesn't get lost even when competing with Doane's grid+lines scheme, and I can read it from a foot or so away so the ink is not too pale. The only drawback is that to my eyes there seems to be a hint of green in the gray. Your mileage may vary. If you're looking for a gray gel ink needle point pen to add to your collection definitely try this one. I love the double takes from my colleagues, who should be used to my penchant for crazy-colored inks by now. Diamine has some unique ink colors, but I've only sampled Pumpkin and so was looking for something else to play with when I spotted the Flamingo Pink. If there was one color I absolutely refused to wear as a child or into adulthood, it's pink. I'm not a fan of it at all. But then came the 80s and Miami Vice and the hot colors of the Keys, and vibrant pinks caught my eye and opened my wallet. Flamingo Pink is very hot, though this scan is a bit too red. It's a beautiful color, not exactly coral and not as muted as a real flamingo's pink feathers. It makes a statement, but I'm not sure just what the message is. So I'll leave that up to the reader and enjoy my Flamingo Pink ink. While browsing the inks at Art Brown International Pen Shop recently I came across the Noodler's V-Mail series, and suddenly realized I don't own any green inks. This was immediately rectified, and I left with a bottle of G.I. Green. I wasn't sure if this was the original or re-mixed version, but browsing around Foundation Pen Network leads me to conclude this is the new green. It doesn't fade to olive khaki with an orange halo, but stays a vibrant combat green. 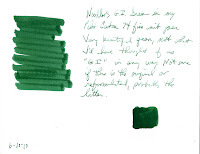 The green color is definitely intense, and was very noticeable even using my Pilot Namiki Custom 74 fine point. I do love the 3 oz bottle it comes in, with the pictures of different war planes on it. Definitely a great color and shades nicely, with not too much ink creep on the nib. I've looked at the Pilot FriXion erasable pens at JetPens for some time, but hadn't thought about buying any until I came across them at a fairly new book store in New York Ctiy, BOOK-OFF. A Japanese corporation that's been moving into the US market, BOOK-OFF opened in April on W. 45th Street near 6th Avenue, just a short walk from Art Brown International Pen Shop. On my way home from Art Brown over the weekend I decided to see what BOOK-OFF was all about: $1, $2, and half-price books, DVDs, CDs and more. The "more" turned out to be Japanse pens, including the Pilot FriXion and Kokuyo Beetle Tip markers. (There was a Dr. Grip in pink, but I wasn't in a Sailor Moon mood and passed.) As everything was half-price although limited (blue pens and green and pink markers only), I stocked up on pens, along with Hans Holzer's Ghosts I"ve Met (wonderful just to take in the vastness of Holzer's ego, forget about the ghosts) and Jacob Burkhardt's The Civiliation of the Renaissance in Italy, and went on my way. The Pilot Frixion uses friction to erase the gel ink, the eraser at the end of the pen being the secret to erasing the thermo ink. The bought a dark blue 0.7m and a light blue 0.5m to try out, and find I like the darker blue ink and wider line of the 0.7m. 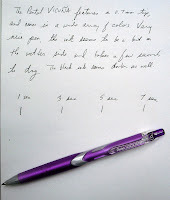 The pen doesn't write at first, but skips for a few words until the ink starts flowing smoothly. But it does definitely erase every bit of gel ink, although re-writing over the erased area is a tad difficutl. The ink doesn't seem to want to lay down over the erasure, but with the other choice being an ugly cross-out this is fine. I tried them out on my Rhodia No. 19 dotPad, and have to say the lighter blue really got lost on this paper. If you happen to be in NYC and near W. 45th and 6th Avenue (or I should say Avenue of the Americas), check out BOOK-OFF for the books and the pens. The latter is easy to find, they're right at the check out counter, where you'll be in everyone's way as you sort through the cart. Pensters won't be deterred by that, and the counter staff are very friendly and understanding. If you've shopped around on eBay for pens then you've probably run across engeika, who carries a mouth-watering inventory of exquisite pens. Quite a few aren't available in the US, and he offers many with starting bids of $0.99. However, winning takes perseverance as everyone wants a high-end pen for half price. So bidding is fierce, and I've had a few disappointments. 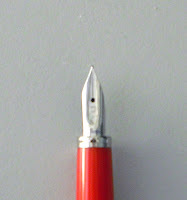 One pen I saw that intrigued me was this red Platinum European Ingrid Bergman Affection fountain pen with a fine nib. Engeika's listing states it is similar to the Montblanc limited edition Ingrid Bergman pen, which is nice design but not of interest to me. So I was hesitant to bid, but decided to go for it--and I won! Engeika charges $13 shipping, and there's a good reason: all items are sent air mail from Japan. I won this pen on June 10 around 7:30 pm, and sent payment right away. 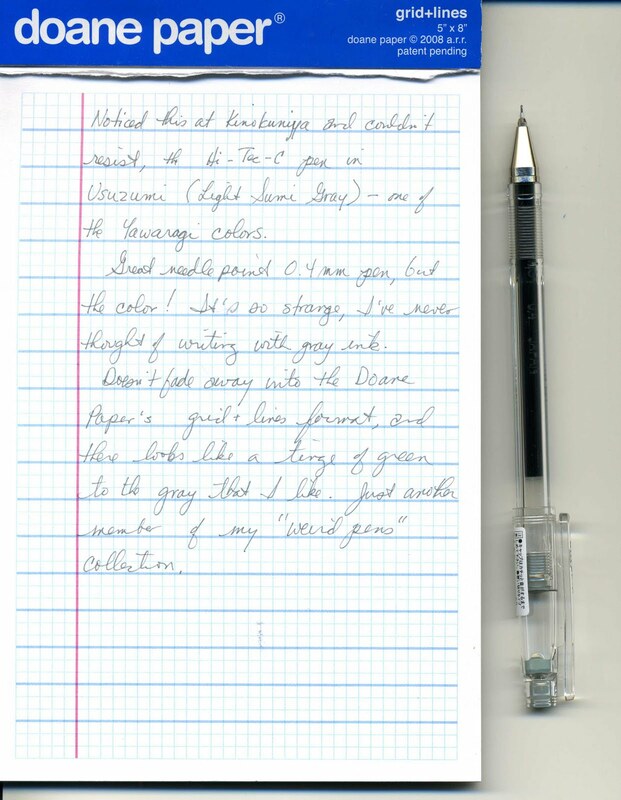 The pen was shipped on June 12, and I received an email from engeika with a tracking number. The pen mades its way around Tokyo on the 13th, arrived at JFK airport on the 14th, went through sorting, and was delivered to me on June 15th in the afternoon mail. The Air Mail and tracking fee wa definitely worth it. 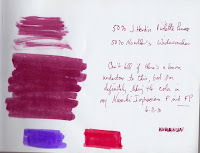 If you've looked for Iroshizuku ink on eBay then you've probably seen engeika's sales items. With the price increase (pat myself on the back here for a post in December on how this might work out, l0l), and the ink now available at other venues besides JetPens.com, engeika's eBay store looks like a good place to bid on this ink. Even with the shipping, you might end up with a cheaper bottle. And as this is coming from Japan, there might also be some special edition colors available. Keep checking! After all that, how does this Platinum pen actually write? First, the Platinum Affection comes with a converter and two ink cartridges (long and short). I decided to ink up with my Platinum Reserve Black Magic Blue and try it out. The pen fits nicely in my hand, there is just a touch of ink creep on the nib, and the nib did start off feeling scratchy. But as I've used it, the ink creep is gone, the nib is quiet and pliant, and the pen still feels great in my hand. I love the color, which is red with some orange in it. It's a slim pen, not a cigar at all but elegant and delicate. The nipped waist gives is a slightly hourglass look, Ingrid Bergman wearing the the 1947 New Look fashion. The nib is what got me, however: it's a plain steel nib with no decoration, and I love it for its simplicity and sleekness. So in terms of looks it's an A+, and in terms of writing I'd give it a solid A. A very nice auction win for all of $25.53, and I'm very happy with it. Engeika offers many middle- and up-scale pens, all of excellent quality, for auction. Quite a few are not available in the US market (I've had my eye on that Pilot Grance in Yamabouki for ages, but didn't win this last time). I've read some complaints over at the Fountain Pen Network, but on the whole people there seem to have a high regard for this sell. Do go check out this store on eBay, you might just find--and win--a great pen. 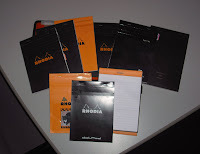 UPDATE: engeika seems to be a Rhodia notepad fan as well. Decided I'd try making a burgundy ink with what I had on hand rather than purchase Waterman and Sheaffer inks for the job. 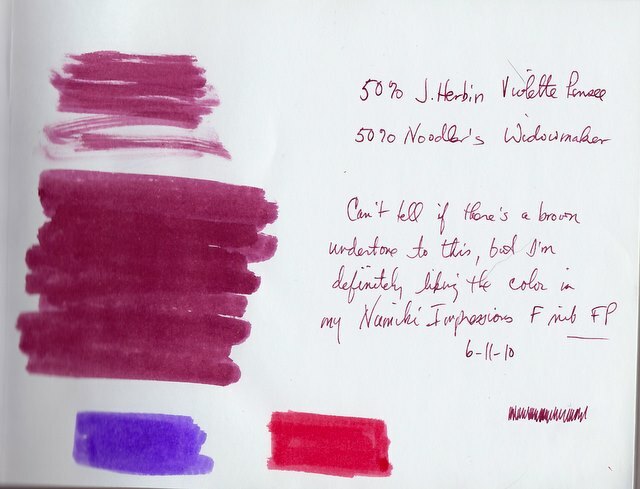 The J. Herbin Violette Pensee is true purple color, but Noodler's Widowmaker isn't a true red. However, the mix looks good and I'm having a lot of fun using this ink. I'm thinking of adding a drop or two of black to darken it a bit, but I can't think of what else would look good. Orange? Stationery giant Kokuyo is best known for its notepads and paper products, but strolling around Kinokuniya recently I found their office products as well. 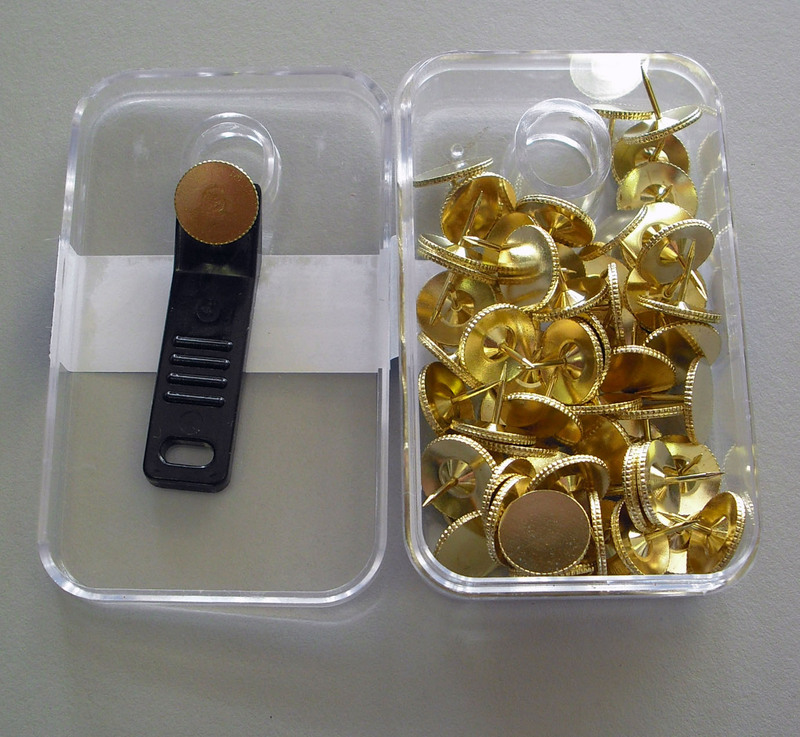 I was very taken by these round, gold thumbtacks with serrated edging and flat tops. For some time now I have wanted to tack some photos to my work bulletin board, but didn't want to use the plastic darts common to office supply rooms. These are elegant, and the tacktool that came with it was a well though out detail--all for $2.25. Since 2002 the company has sponsored the Kokuyo Design Award, and international competition that seeks to commercialize outstanding product designs presented from designers and users worldwide. The Kokuyo Beetle Tip 3 Way Highlighter was one of the 2007 Award winners. (Above) Mary (or May) Nordmeyer, Spencerian. 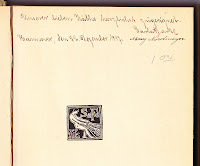 Below the inscription, the colophon shows S. Fischer Verlag gathering popular and literary authors in its net. “Unserer lieben Käthe herzlichst ----------. The inscription appears to have been written with an extra fine nib. Faded only slightly by my guess, the ink is black, less color-saturated than today’s Private Reserve, with a slight chocolate cast. No feathering or bleeding. 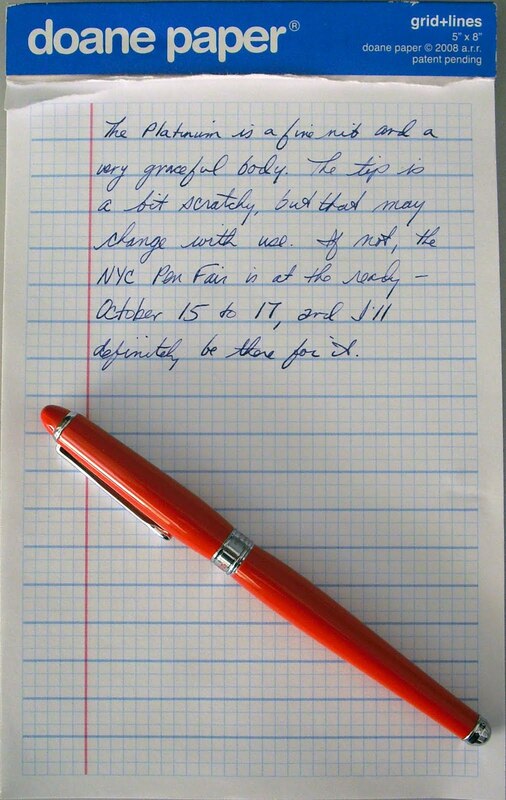 The consistency of color saturation throughout, and the absence of overlap strokes suggest, in my view, a fountain pen was used rather than a dip pen. 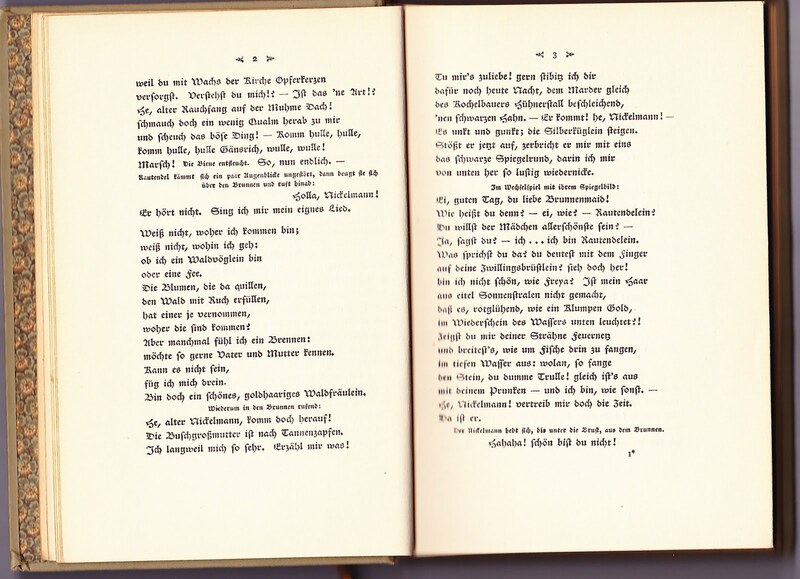 (Left) Title page, Die versunkene Glocke, The Sunken Bell, 1913 printing of the 1896 play. Yes, the small type beneath Hauptmann's name says "85th edition"! 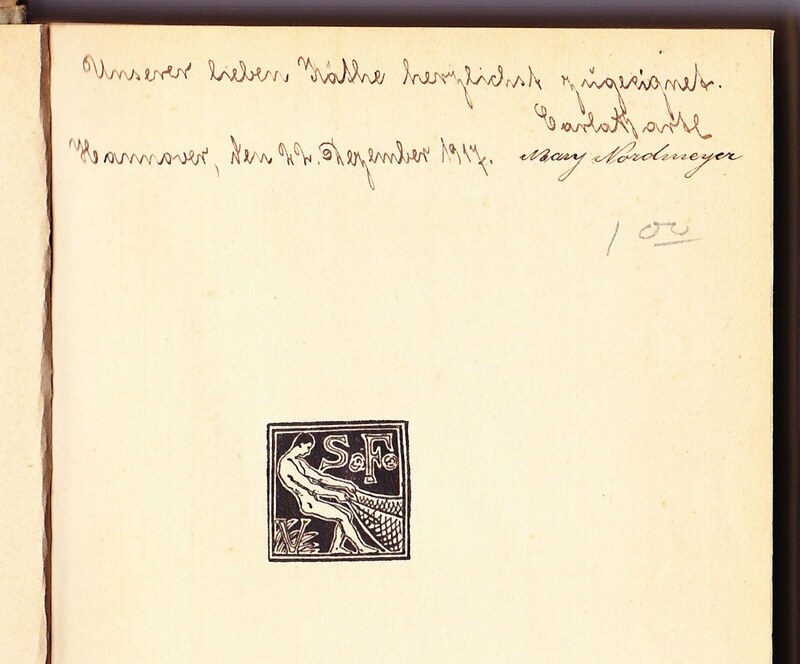 German playwright Gerhart Hauptmann had written Die versunkene Glocke, The Sunken Bell, and the above inscription was found on the book’s flyleaf. Published first in 1896 (one Web source gives 1897) by Berlin’s S. Fischer Verlag, this 1913 edition remained in near pristine condition on its remarkable journey from the Leipzig printer nearly a century ago to the university library giveaway in Youngstown, Ohio, which is where I found it a few years ago. (Right) Prozac penman. 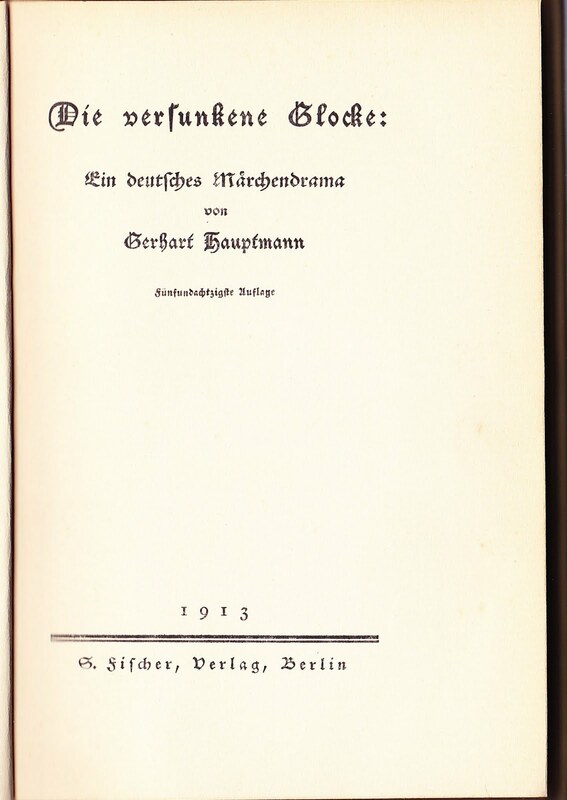 Gerhart Hauptmann's collected works to date, shown here, joined those of Emile Zola in France, and Theodore Dreiser in America as exemplars of literary naturalism, sometimes criticized for its deep pessimism. But, back to the inscription. My German has veered somewhere between near native speaker to tourist grade. These days it’s the latter. Still, why was a routine gloss in a book so puzzling? One word was unintelligible, possibly misspelled, or a colloquialism of the day. Another seemed to be a botched signature, of all things, because the other possibilities seemed even less probable. “[To] our dear Kathy, most heartfelt blessings. My sister and I calculated we’d “earned” as “freelance translators”, hobbyists really, a small coffee each if we’d been on the clock. Freelance translators, the real ones, occupy America’s vast ghetto of high-skill jobs that pay next to nothing. How do you put it politely? The minimum-wage day laborer is likely to earn more than many of America’s adjunct professors, academic abstractors, and computer code writers. Do you see the inscription’s mystery yet? Mary [or May] Nordmeyer’s signature is not written in the spidery German Lateinisch, but in an elegant hand that seems to be a modified Spencerian! (Above) Fraktur type, which still suggests Merrye Olde Europe. Mary and her friends had another wartime "turnip winter" ahead, then the peacetime food blockade. Higher speed press runs, popular literacy, and increasing disposable incomes called out for more tractable typefaces. America had declared war on Germany in April. Was Mary an enemy alien, an American citizen awaiting repatriation to the States? Was she German-born but raised in America, and found herself once again in Germany at a bad time in history? Had she travelled to Germany for school or work? What was her connection to Carlotta and Kathy? What happened to all of them? The case with a soft feeling. Please use in any way you like. 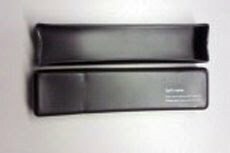 The case is bigger than a gel ink pen but too small for pencils until they've been sharpened down quite a bit. It's a cute addition to the case collection, although a bit pricey ($9.95) when compared to JetPens. Still, it's attractive and will definitely protect your pen collection from damage. 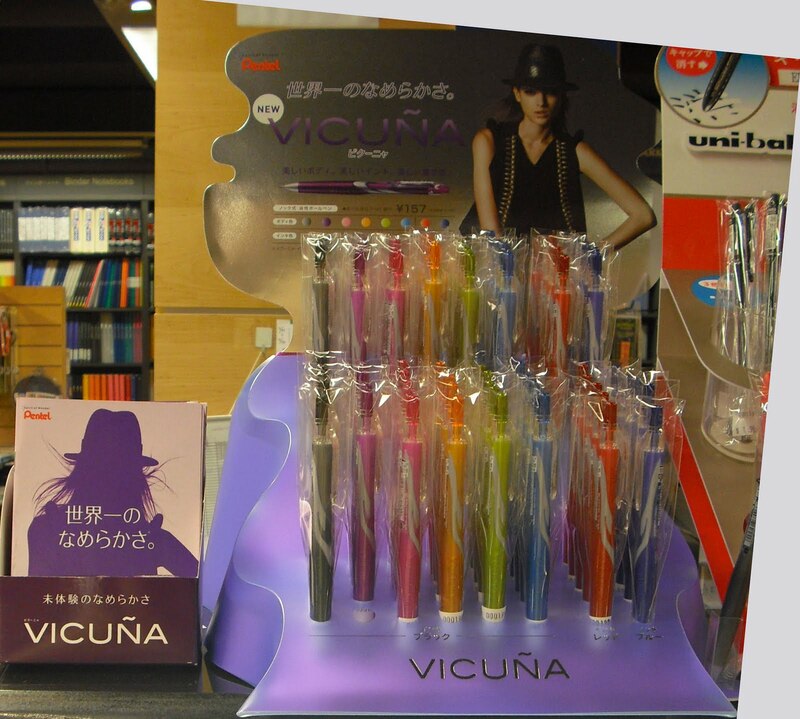 Stopped by Kinokuniya over the weekend to check out any new pens or notepads and saw this display for the Pentel VICUNA. I have to say I was rather taken by it: the display included a 12-page booklet in Japanese (to the left in the above picture) featuring a young woman in black, wearing a Michael Jacksonesque fedora, lots of black eyeliner, and pale lips. For some reason it reminds me of the Virginia Slims cigarette ads of the 70s. 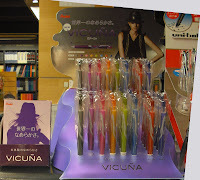 From what I could find on the internet, the VICUNA is a "three ink" pen designed with women in mind ("You've come a long way baby" for those who remember that tag line). I think they simply mean three inks were blended to make the one black gel ink used in the cartridge in the pen. I did notice when writing with it that the black ink is very dark and lays down on the paper slightly damp but dries very fast. It's a nice pen, the colors are very cute (I chose purple, but could have gone with orange), and costs about $3. What I'm curious to know is why it's call the VICUNA (all caps)--the plastic molded name on the pen even includes the tilde (the wavy line) over the capital "N" so it's definitely Spanish and meant to invoke the Andean camelid. Uhmm...huh? TonyB at Tiger Pens Blog is hosting the 11th Carnival of Pen, Pencial and Paper, lots of interesting submissions so do take a look. Walking the National Stationery Store aisles takes a lot of stamina, and so as C and I got to the end of one aisle towards the middle of the show area we stopped for a snack and a rest. That's when C spotted some small, unadorned tables loaded with paper and brochures quite a distance from the rest of the booths. Welcome to Mr. Ellie Pooh, 100% recycled paper made from 75% elephant dung and 25% post consumer paper using natural vegetative binding agents in the paper-making process and water-soluble salt dyes for coloring. Given how "green" many of the booths at the NSS were, I have to say this was the only manufacturer marketing elephant dung paper. C and I spoke with Karl Wald, the guy behind Mr. Ellie Pooh, for a few minutes and looked at the different pooh products. And there are a lot of them to check out! Note pads, memo pads, pins, stationery, pooh paper heart boxes in an assortment of distinctive colors--check out the website for the product line and retailers in your area. What does the paper feel like? Amazingly, it does remind me of linen or rag paper. There's a wonderful roughness to it that puts me in mind of the fine paper at Kate's Paperie or other paper shops. I'm not sure how fountain pen friendly this paper might be, but I'll look for it in NYC and report back to everyone. 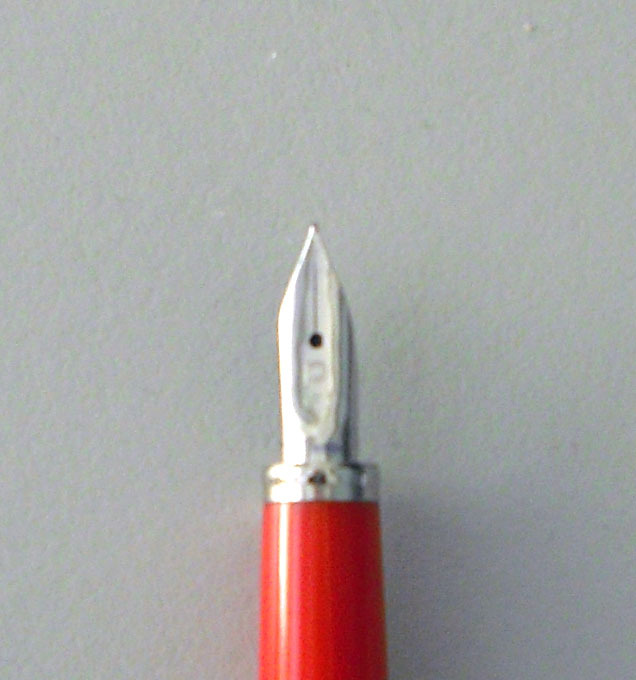 Recently added to my fountain pen collection is this Pelikan Technixx medium nib fountain pen. This has to be one of the best representations of German precision and detail-oriented thinking I've ever seen, starting with the metal case. First, the color--it's a really deep blue brushed metal finish (aluminum, I think). The brush finish gives the barrel a softness that kind of tickles the fingers. What really caught my eye is the spring motion solid clip on the cap. When I was going over the pen visually I must have spent 20 or 30 seconds just looking at the clip, which is just an amazing piece of solid metal held in place by two small screws. Ever post a cap on a fountain pen and then worried it might fall off? That definitely won't happen with the Technixx, as there is a small, round metal disc on the end of the barrel that catches in the cap and mades a very audible click when posted. It reminds me of a lipstick being closed, and is another fine detail that sets this pen apart. Finally, the nib is impressive. It's just a regular steel nib, but for some reason the pen's body makes it look slimmer and longer when writing. It isn't but it's a great trick on the eyes. In addition, I was very impressed with the way the pen handled the Noodler's Blue Manhattan ink: I tried the pen out, put it away for two weeks, then uncapped it and started writing immediately. No shaking the pen to get ink into the capillary, no dry ink marks on the paper as I tried to get ink through the nib, it just worked even after sitting on a table all alone for two weeks. The nib is very wet, but that could be the Noodler's or it could be the nib so I'll give it a try with some Iroshizuku. It writes well and smoothly if a bit on the wet side, but I'm still not a medium-nib fan so I'm considering an adjustment of some sort. The pen can use cartridges or a converter, I chose the latter which is seen in the above pic. Swisher Pens has the Technixx (blue medium nib only) in its clearance section if you're interested. And the Winner Is RC! The winner of the Kum Correc-Tri Sharpener is post #3 from RC. Send me an email at diane.fennel AT gmail.com and I'll send your sharpener out, bubble wrapped, as soon as I can. Thanks to everyone who left a comment. I've got lots of giveaways planned for the blog's 1 year anniversary in August (including a bottle of Iroshizuku ink I accidentally bought twice), so do drop by and check out the posts. 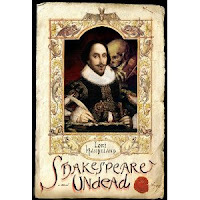 In this rather clumsy historical mashup, bestseller Handeland (Chaos Bites) pairs zombies and vampires with another perennially popular figure: Shakespeare. Zombies have invaded 1592 London and it's up to William Shakespeare, whose genius with a quill comes from his extended life as a vampire, to stop them. Aided by Katherine, a zombie hunter to whom he is consummately, perilously attracted (and who bears considerable similarity to Viola in the film Shakespeare in Love, down to her horrible fiancé and goofy nurse), Will is soon embroiled in a mysterious plot that endangers all of London. Handeland blends Elizabethan and contemporary language skillfully and mostly unobtrusively, and the romance sizzles between the intriguing leads. Unfortunately, the novel is hampered by excessive shout-outs to the Shakespearean canon and a rushed ending. 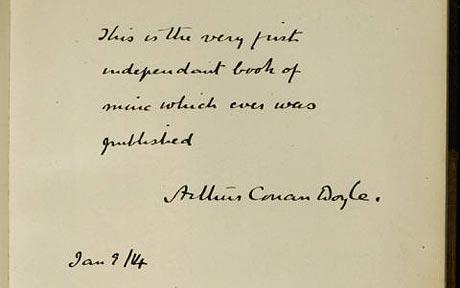 An inscribed copy of A Study in Scarlet, marking the debut of Sherlock Holmes, will go up for auction at Sotheby's in London this summer. Look at Doyle's beatiful, even script--you can almost feel the fountain pen moving over that glorious-looking blank paper. Deep black ink still looks fresh and dark, like it was just written this morning. I like the idiosyncracies in Doyle's writing--the period after his signature, the small crossing line of the "t" in Arthur coming way after the letter. the "f" in first and "p" in published looking a bit odd and Spencerian. The date is January 9, and the year looks like "/14" or 1914. Someone will have a collector's item to ponder come the fall. My office and several others in the northeast space of my building are being "refreshed" with a new paint job, some new furniture, and demolding the corners. So I have to spend the day packing and moving to a temporary space, and haven't got anything of interest for you. But if you get the chance head over to penciltalk and take a look at this amazing Graf von Faber- Castell silver pencil extender set. Absolutely beautiful. When I moved my work into another office to take up residence until the refresh is done, one of the facilities management guys took a look at my Rhodia dotPad and started drooling. Another convert to the cause! The Rhodia No. 16 Notepad has to be my favorite pad of all time. Size A5, or 5.8 x 8.3, this pad fits neatly into my purse, backpack, padfolio, or hand. It's a great size to have around for note-taking, swabbing ink colors, writing affirmations over and over and over, working out ritual murders of (for purposes of this blog) unnamed a$$holes and inheriting all their money (beats counting sheep when the insomnia kicks in)--whatever takes your fancy. I have at least 7 Rhodia No. 16 pads, and two "Kindofs"--a Clairefontaine Pupitre pad that is the exact same size as the No. 16, and a Mnemosyne No. 188 pad that is also listed as A5 but just slightly larger (the two black pads at the upper far right of the pic). I seem to have mostly graph and lined No. 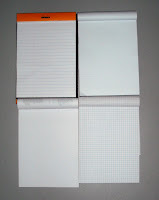 16 notepads, just one blank and only one dotPad--so far. I'm planning on picking up a few more dotPads, as they seem to me to be the best of them all: the dots give you a way to write straight down the sheet, but aren't as intrusive as graph or lines. But the pad isn't blank, which is nice to look at. I think this comes as close to being the perfect pad as I can get. 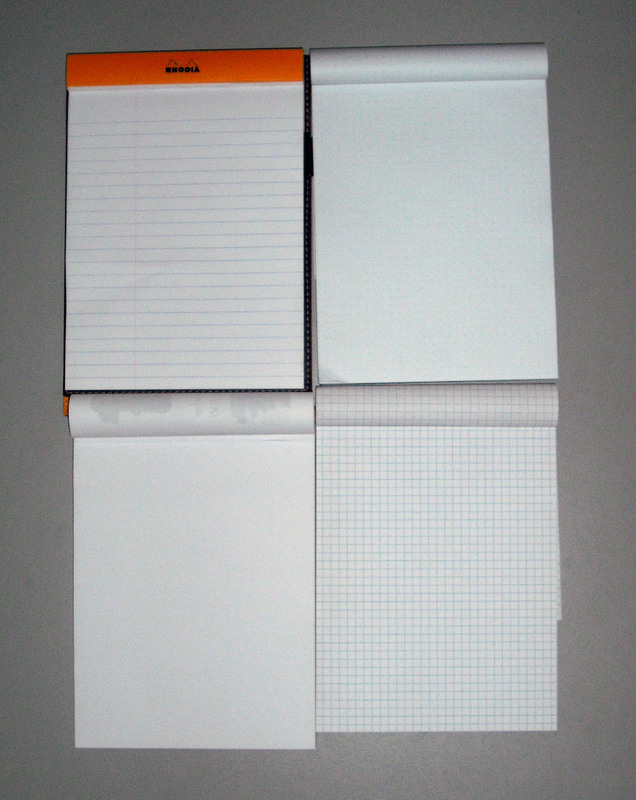 The four pads in the pic are, from top left going clockwise: lined, dotpad, graph, and blank. Anyone else have a Rhodia favorite size/number? Where is everyone located? I'll go first: Born and raised in Allentown, PA, currently living in New York City. 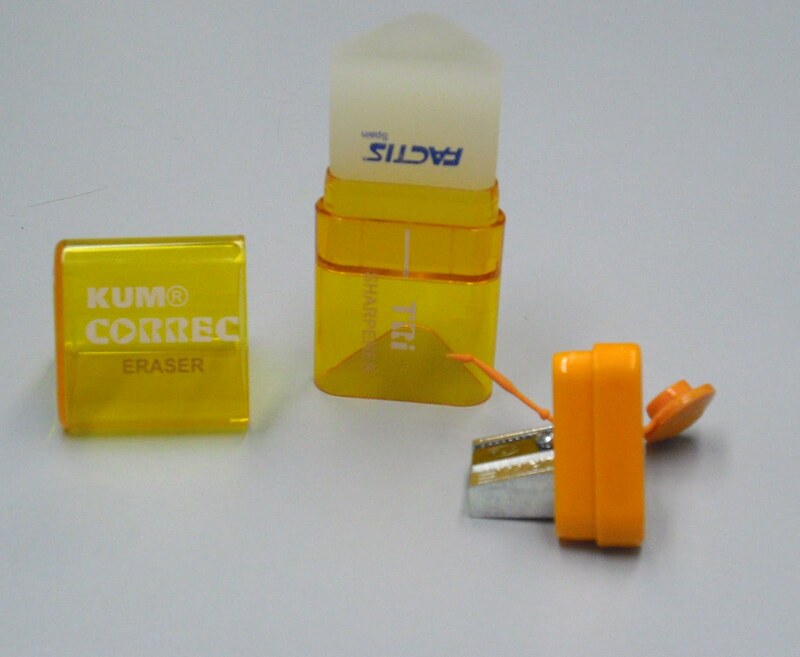 This KUM Correc-Tri orange pencil sharpener is up for grabs to one lucky commenter in the second Pocket Blonde Giveaway Contest. 1. The giveaway runs through Saturday at 5:30 pm, when I will pick one winner randomly from comments using a random number generator. 2. The first commenter will have the number 1, the second commenter will be number 2, and down the line. 3. I will announce the winner on Sunday, June 6. At that time, you will have one week to email me to claim your prize. If this goes unclaimed, a new winner will be chosen. Inkyjournal just got the new Lamy Al-Star in Coffee Brown (I'm jealous). 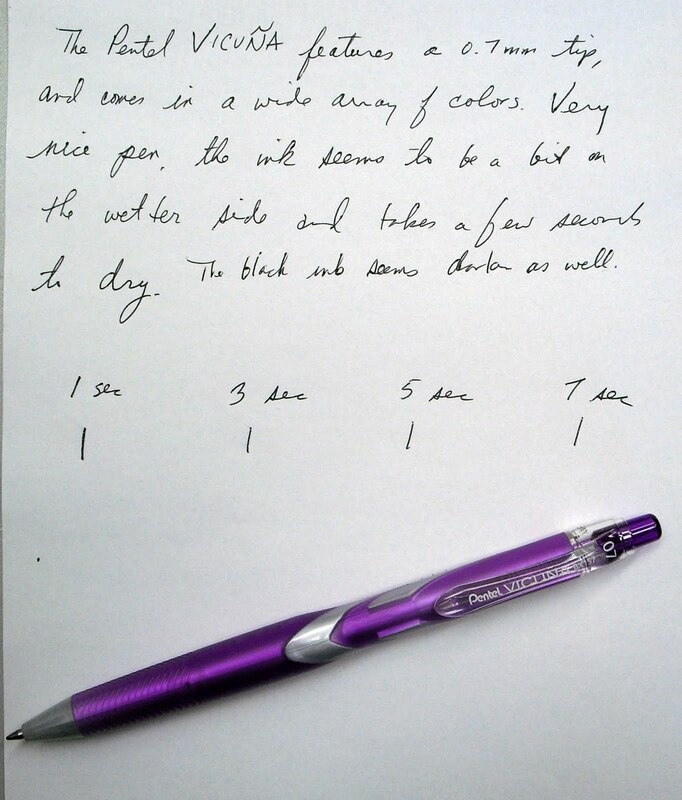 Check out the great review and beautiful color of this pen. 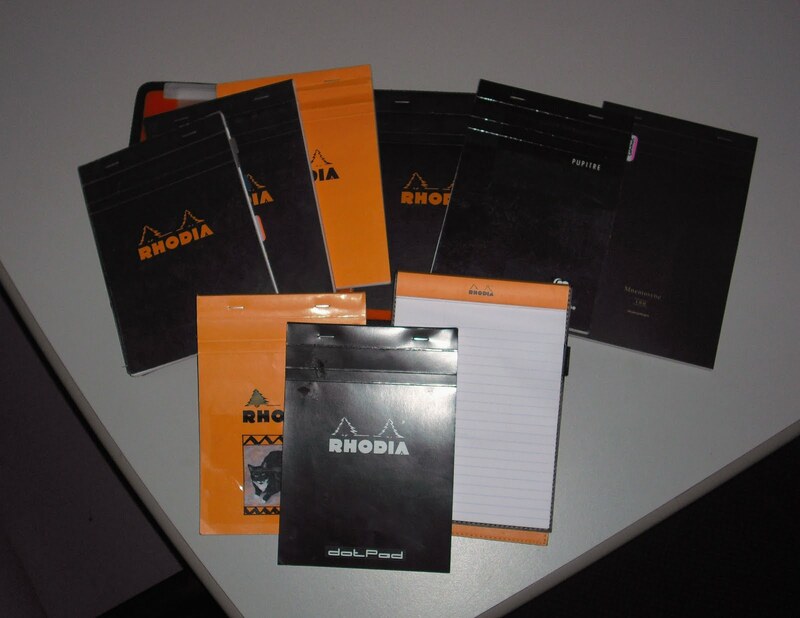 Head over to Rhodia Drive and enter to win one of the new Rhodia dotPads. These are a fantastic addition to the Rhodia lineup! Pictura, Inc. was founded in Sweden in 1969 with a product base of yarn knitting samples. The company branched out to include postcards and other paper products, and came to the US in 1980. Sometime in the late 1980s Pictura introduced the Purse Pad, a beautifully-designed small, rectangular notepad with a magnetic closure (from their website it looks like the Indigo Moon pattern was the original purse pad, and the pads are still labeled Indigo Moon on the back). These are great notepads, which you may have seen at your local stationery shop as they are beautiful and inexpensive--two necessary enticements for opening the change purse or wallet. I've got a few of these around, and have given them as gifts. Some may find them a bit too decorative, but that's really their point: somewhat over-the-top beauty. There's a Victorian feel to these, like 1890s collectible cards. The design is excellent with lovely pictures that are wonderfully detailed and colorful. The writing paper is quite good, and the pad has a magnetic closure to keep the paper intact and safe from wear. The Pictura product line includes notepads and hand mirrors if you really want to accessorize. At the National Stationery Show the Pictura booths (about 5 or 6 total) carried what looked to be like a thousand or so samples of purse pads and accessories. This seashell motif is one of my favorites, but there are so many to choose from that you can spend an hour trying to decide. 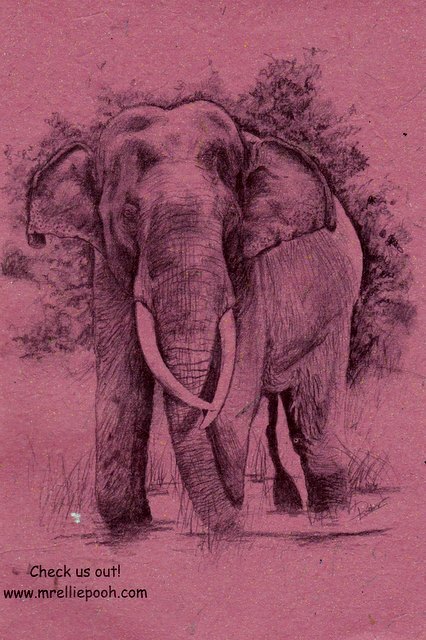 This is a frilly line of notepads that, I suspect, is meant to appeal to one's inner Barbara Cartland--which is quite a large audience, when you think about it.